Welcome to another pattern from Missed Stitches! 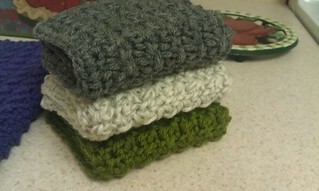 This one is a simple, easy dish cloth that you can make several of as gifts for Christmas, House-warming, even birthday! Use up your scrap balls of yarn for this project! This crochet dish cloth works up quickly so you can get quite a few done in a day! I prefer to use a scratchy acrylic yarn such as Bernat Super Saver. It's soft, but scratchy for cleaning and absorbent too. This pattern works fine with cotton yarn and the spacing of stitches allows for thorough air-drying. Row 2: sc in 1st sc, (ch 1, sk 1 ch, sc) to the end. Ch 1, turn. Repeat rows 4 and 5 to the desired size. Mine finished out at 7 3/4" square! I make mine using acrylic yarn because I like the scritchy texture! I didn't use brackets, as is the norm for crochet patterns. My apologies. It's a repeat of those stitches to the end of the row. I made this dishcloth and wanted to add it to my Rav projects. I added your pattern so I could add my project. Please look it over and make any changes necessary. BTW - I love this cloth!! Thank you so much for this pattern!! It is perfect! A friend gave me several huge skeins of Sugar and Cream yarn and I wanted to make dish cloths to donate to the Christmas boxes we give from church to families in need. I have got my first one about half done and love the way it is coming along. 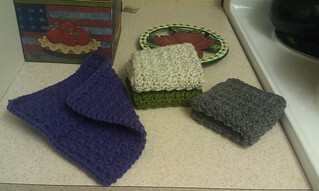 Does the acrylic yarn really do well for dish cloths? I really think that depends on the brand, honestly. For example, a brand with a rough texture such as Red Heart basic or Bernat Super Saver would likely do nicely to give it that scrubby texture. I have found that some cottons, such as the well-known Lily N Cream don't seem to absorb well; at least not in my experience. I prefer to use the Bernat Super Saver. Absorbs and scrubs well. are you a 'loose crocheter" or a 'tight crocheter" the reason I ask is because I find that I need a larger hook size for things like this because I am a "tight crocheter'. ALSO I know where you can find a super super soft cotton to make your spa cloths! It's called "I love this cotton" and it's sold at Hobby Lobby. It's my 'go to' cotton for spa cloths and also for baby bath cloths... try it I know you'll love it! I just discovered the "I love this cotton" from Hobby Lobby myself and I love, love, love it too!! Its very soft, and absorbent so I've been making everything with it... you just can't beat cotton for lots of items!! Wow! I love this pattern. It was easy AND fast! Thank you for sharing. Love the pattern and thanks so much for sharing. I made this out of cotton yarn. Pattern is a breeze. Thank you. SK is a very common crochet term that means skip. When you see it, you should see another abbreviation that follows which indicates the stitch you are to skip. I am looking forward to trying this pattern, I am a total beginner. Can someone point me in the right direction for crochet terms and examples of those?